"You are not Captain Kirk. You do not belong in control of the Enterprise, and I will do everything in my power against you." In the final episode of the original series, the crew of the Enterprise takes a distress call from Camus II after most of its residents died from radiation. Kirk (William Shatner) recognizes one of the survivors as a former lover—Janice Lester (Sanora Smith). Although he treats her kindly, she abhors him and takes over his body to achieve control of the Enterprise. 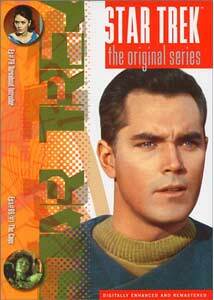 Trapped in Lester's body, Kirk must find a way to convince the crew that their supposed captain is an imposter. This personality switch once again gives Shatner a chance to alter his usual silly persona. Instead of his slow, deliberate manner of speaking, he now acts quickly without thinking of the consequences. Shatner's trademark overacting works here because of Lester's emotional instability and short temper. Spock (Leonard Nimoy) and McCoy (Deforest Kelley) quickly discern that all is not kosher with their captain, and it's interesting to watch them maneuver to discover the reasons for this change. Spock's logic drives Lester into a frenzy because he's immune to her false motives, even from Kirk's body. Their confrontation over the proper destination for the ship is one of several compelling moments in this episode. Although varying types of mind transfers have occurred in this series, Turnabout Intruder doesn't feel as stale as you might expect. Instead, the story contains inventive touches to keep the material from growing too predictable. Although trapped in Lester's body, Kirk still performs his Captain's Log in his brain, even without knowledge of the proper stardate. Lester's thoughts also reveal themselves and further the odd nature of the whole situation. Another effective scene has McCoy and Scotty (James Doohan) discussing whether to vote against Spock for mutiny. Their conversation is surprisingly poignant and offers the personal complexity needed to carry the best episodes. While the similarity of this episode to previous ones keeps it from reaching the top echelons of Star Trek: The Original Series, it still provides enjoyable entertainment. The switch of bodies allows both Shatner and Smith some creative acting possibilities, and they both perform well. Kelley and Nimoy are solid as always, and their confused reactions to Kirk's new personality keep the tension high. This was the last show aired, and it's too bad that creator Gene Roddenberry wasn't given warning to provide a fitting send-off for the series. Of course, the release of numerous successful feature films rectified that problem. Finally available on DVD, this episode was the original pilot of the series, but the network rejected it. They were looking more for a "space western," and the prominent place of women and other races also caused problems. Spock is the only crew member who went on to star in the actual shows that aired. The captain of the Enterprise is Christopher Pike (Jeffrey Hunter)—a more serious, conventional leader lacking the eccentricities of Kirk. Even given these differences, The Cage is actually one of my favorite Star Trek episodes. Following a distress call from an Earth vessel that disappeared 18 years earlier, the crew lands on an unexplored planet and discovers the surviving members. However, they are just an illusion created by a strange race of extremely intelligent beings to capture Pike. These creatures have giant brains three times the size of a normal human, and this gives them the ability to manipulate minds into seeing virtually anything. Once imprisoned, Pike's reactions to various scenarios are studied while he attempts to escape. They're especially interested in hooking him up with Vina (Susan Oliver)—a gorgeous young woman who is a perfect match for the captain. While his crew searches for a way to free him, Pike remains trapped in a perplexing mental prison. This episode appears in variations that follow the same exact story, but each one presents it differently. The original version incorporates black & white footage from the pilot with color footage from The Menagerie—an from Star Trek that relates the story. The restored version includes the long lost color footage believed to be lost from the pilot. Gene Roddenberry appears in a six-minute introduction from 1986 before the first one. During this piece, he discusses the interesting history of The Cage and the network's objections to it. He also returns for a brief comment at its conclusion. I watched many of the original episodes in syndication as a kid, and The Cage is one that stood out in my mind for a long time. Although this crew lacks the chemistry that carried the series and subesequent films, this tale is one of Roddenberry's best creations. The dramatic moments avoid the hokey nature of some later episodes, and the tension remains significant throughout the story. Image Transfer Review: Both Turnabout Intruder and the restored version of The Cage feature an impressive full-frame transfer that nicely conveys the numerous colors utilized. The odd reds, blues, and yellows on the Enterprise shine with brightness in the first episode and lead to a decent picture. The otherworldly creations in the pilot episode appear especially clearly on the screen. This series does face the limitations of its television origins, which adds a few blemishes to the transfer. The original version of The Cage also includes attractive colors, but its black & white footage falls well short of this quality. This is due to the lesser nature of the source material, which has defects that are probably not repairable. The older black & white shots do create a nostalgic feeling that is missing from the restored episode. Audio Transfer Review: Similar to the visual transfers, the 5.1-channel Dolby Digital tracks work strongly for the prominent color episodes. However, the black & white version of The Cage offers a muffled sound within a stereo transfer that lacks the depth of its companions. This is especially evident during the black & white footage, which stems from an older transfer. Once again, there's obviously no help available for this version, and you may choose the restored version for a better quality presentation. Extras Review: Turnabout Intruder includes the original preview trailer, which presents many of the key scenes and gives away pivotal aspects of the plot. Both episodes offer the option of English subtitles for the hearing impaired. This format of supplements matches the typical amount for each volume of this series. This release stands out as one of the highlights of Star Trek: The Original Series on DVD due to the inclusion of its original pilot episode. The Cage provides a glimpse at Roddenberry's initial idea of a more dramatic type of series within the science fiction genre. Combined with Turnabout Intruder, another solid entry and the last show aired, this disc provides plenty of worthwhile entertainment value.